Although his actual birthday is unknown, most historians agree that Crazy Horse was born around 1840 in present-day South Dakota. From the day he was born, Crazy Horse’s hair and skin was much lighter than the other boys in the Lakota tribe. His mother called him Light Hair, which was the name he kept until he proved himself in battle. Then his father called him Crazy Horse. The name didn’t mean that he was crazy but that he had spirit and energy. Like other kids who look different than their peers, Crazy Horse probably endured a lot of teasing. His father’s work also made Crazy Horse stand out in a community that valued athletic jobs. According to some accounts, his father did not have the traditional Lakota occupation of hunter/warrior. Instead, Crazy Horse’s father worked as a medicine man. Instead of feeling hurt by his peers, their teasing only made Crazy Horse want to excel in whatever area he could. As he grew, his uncles and other members of the Lakota community helped him develop the skills of a good hunter. One day he received the gift of a bow and was taught how to carry it, maintain it, and shoot it properly. The first living things he shot at were grasshoppers. His teachers wanted him to learn to learn to shoot precisely, and grasshoppers, being small and fast, presented a challenge for the young boy. Shooting grasshoppers taught Crazy Horse patience and humility. Eventually, his arrows came closer to hitting their targets. Crazy Horse’s skill and patience caused a great hunter/warrior named High Back Bone to notice him. After asking for his father’s permission, High Back Bone became the boy’s teacher. By age twelve, Crazy Horse’s skill with the bow was nearly perfect. His arrows killed many grasshoppers. He also knew how to wait patiently for deer until the animal got close enough for him to kill it with one shot. The Lakota tribe moved according to the seasons, following the animals they depended on for food. They especially prized the buffalo. Crazy Horse went along on buffalo chases, but as a boy he could only watch the more experienced hunters. 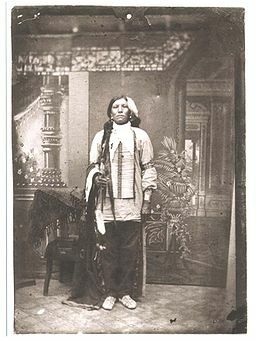 Since he couldn’t participate in the adults’ buffalo hunts, Crazy Horse imitated the hunters with his friend Lone Bear. One of the boys pretended to be the buffalo and galloped away on his horse from the other who acted as the hunter. The hunter chased the buffalo with a blunt arrow, but even without the dangers of real arrows or a buffalo herd, the game taught the boys to stay on their horses during a chase. Crazy Horse thought he would someday use his skills as a horseman and expert marksman to fight other Indian nations that were his tribe’s enemies. Horn Chips, one of Crazy Horse’s contemporaries, stated, “when we were young all we thought about was going to war with some other nation; all tried to get their names up to the highest…and Crazy Horse wanted to get the highest rank.” Though no one knew it at the time, most of the skills Crazy Horse learned as a boy would be needed for fighting an enemy he had not yet seen—the white man.